فساد مالی یا سوء استفاده از قدرت دولتی برای کسب منفعت شخصی، رویدادی است که در سال‌های اخیر و به ویژه از دهه 1990 به بعد توجه بسیاری از مردم جهان را به خود جلب کرده است. این رویداد دارای عوامل مختلف فرهنگی، اجتماعی، سیاسی، حقوقی و اقتصادی است. هدف مقاله حاضر بررسی اثر فساد مالی بر درآمدهای مالیاتی در برخی کشورهای در حال توسعه می‌باشد. در این راستا با استفاده از شاخص‌های مرکب فساد شامل، شاخص درک فساد (CPI) و شاخص کنترل فساد (CCI) به برآورد دو مدل با رویکرد داده‌های تابلویی برای 27 کشور طی پنج سال 2002-2006 پرداخته شده است. نتایج حاصل از این پژوهش، بیانگر اثر مثبت و معنی‌دار دو شاخص فساد مالی بر نسبت درآمد مالیاتی به تولید ناخالص داخلی (TAX/GDP) است. به عبارت دیگر با افزایش شاخص‌های فساد (کاهش سطح فساد)، نسبت درآمد مالیاتی نیز افزایش می‌یابد. بنابراین به منظور کاهش فساد در کشورهای منتخب باید اصلاحاتی در ساختار مالیاتی در جهت بهبود سیستم مالیاتی این کشورها در نظر گرفته شود. 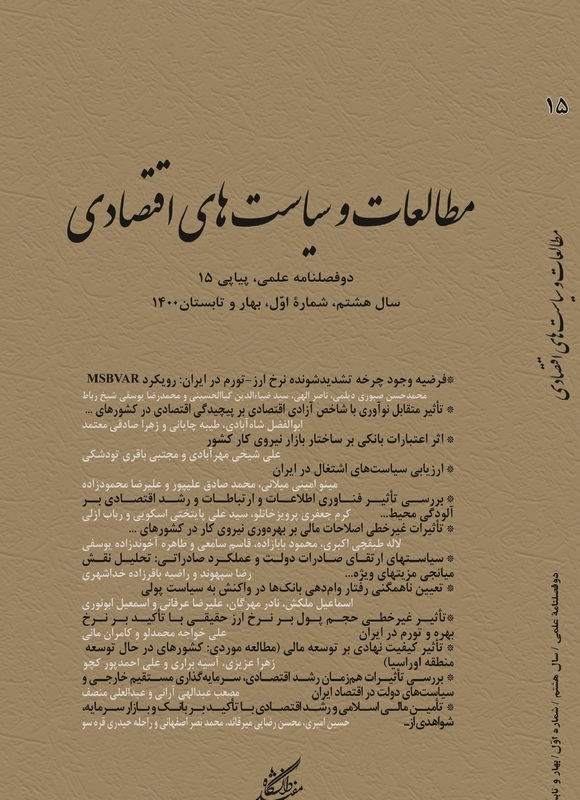 پژویان، جمشید؛ اقتصاد بخش عمومی (مالیات‌ها)، جلد 1، تهران، انتشارات جنگل، چاپ اول، 1386. رهبر، فرهاد؛ میرزاوند، زال‌پور؛ بازشناسی عارضه فساد مالی (ماهیت، گونه‌ها، پیامدها و آموزه‌های تجربی)،جلد اول، جهاد دانشگاهی دانشکده اقتصاد دانشگاه تهران، 1381. ملک، فردریک؛ «توضیحاتی در مورد شاخص درک فساد»، مجمع مصلحت تشخیص نظام، مرکزتحقیقات استراتژیک، معاونت پژوهش‌های اقتصادی، گروه پژوهشی شاخص‌سازی و آینده­پژوهی، مسئول گروه: رؤیا طباطبایی یزدی، 1387. میدری، احمد؛ خیرخواهان، جعفر؛ حکمرانی خوب، دفتر بررسی‌های اقتصادی، مرکز پژوهش‌های مجلس شورای اسلامی، 1383. همدمی خطبه‌سرا، ابوالفضل؛ فساد مالی (علل، زمینه‌ها و راهبردهای مبارزه با آن)، پژوهشکده مطالعات راهبردی غیرانتفاعی، تهران، 1387. A Barreto Raul and James ALM; (2001), "Corruption Optimal Taxation and Growth",Working Paper 01-3, 1-27. Acconcia .A; M. Damato. & R .Martina; (2003), "Corruption and Tax Evasion with Competitive Bribes" Center for Studies in Economics and Finance, Working Paper No.112, pp 1-33. Amal Sanyal and Ira N.Gang and Omkar Goswami; (1998), "Corruption, Tax Evasion and the Laffer Curve" Department of Economics, 1-20. Amaro-Reyes, J & Gould, D; (1983), "The Effects of Corruption on Administrative performance", Working Paper No.580, World Bank, Washington DC. Bahmani-Oskooee, M & Nasir, A; (2002), "Corruption, Law and Order, Bureaucracy, and The Real Exchange Rate", Economic Development and Cultural Change,50(July),pp1021-1028. Bai,C.E & S.J,Wei; (2000), "Quality of Bureaucracy and Open Economy Macro Policies",NBER Working Paper, No.7766. Bardhan. P; (1997), "Corruption and Developing", Journal of Economic Literature,35, pp1320-46. Baumann. F; (2007), "Harassment, Corruption and Tax Policy", European Journal of Political Economy, www.elsevier.com/locate/ejpe, pp1194-1197. Besley.T and Mclaren. G; (1993),"Taxes & Bribery: the Role of Wage Incentives", Economic Journal,103,pp119-141. Blachborn Keith ,Gonzalo F.Forgues-Puccio; (2009), "Why is Corruption Less Harmful in some Countries Than in Others? ", Journal of Economic Behavior and Organization, www.elsevier.com, 1-14. Bird. Richard M, Jorge Martinez-Vazquez & Benno Torgler; (2007),"Tax Effort in Developing Countries and High Income Countries": The Impact of Corruption, Voice and Accountability, Economic Analysis and Policy, Vol.38, No.01,1-18. Del Monte.A & Papagni. E; (2001), "Public Expenditure, Corruption, and Economic Growth: The Case of Italy", European Journal of Political Economy, Vol 17 (2001), pp1-16. Dhaneshwar. G; (1998), "Tax Revenue in Sub-Saharan Africa: Effects of Economic Policies and Corruption", IMF WP/98/135,pp 1-25. Dzhumashev Ratbek; (2009), "Is There Direct Effect of Corruption on Growth", MPRA paper No.18489, 1-17. Farida Mohamad and Fredoun Ahmadi-Esfahani; (2006), "Corruption and Economic Development:Acritical Review of Literature", Agricultural and Resource Economics the University of Sydney, 1-22. Fisman. R & Svensson.J; (2007), "Are Corruption and Taxation Really Harmful to Growth? Firm Level Evidence", Journal of Development Economics: www.elsevier.com/locate/econbase,pp63-75. Fjeldstad Odd-Helge; (2002), "Fighting Fiscal Corruption: The Case of the Tanzania Revenue Authority", WP 2002.3. Flatters Frank and W.Bentley Macleod; (1995), "Administrative Corruption and Taxation", International Tax and Public Finance, 397-417. Gbewopo Attila; (2008), "Corruption,Taxation and Economic Growth:Theory and Evidence", Clermont University De Clermont I,CERDI-UMR CNRS,1-31. Goerke. L; (2006), "Bureaucratic Corruption and Profit Tax Evasion", Working Paper No.1666, pp1-27. Hanousek.Jan & Filip Palda; (2004), "Quality of Government Services and the Civic Duty to Pay Taxes in the Czech and Slovak Republics and Other Transition Countries", Kylos, 237-252. Heidenheimer,Arnold J & M. Johnston and V.T. Levine; (1989), "Political Corruption. A Handbook. New Brunswick: Transaction Publishers". Hillman, A.L; (2004), "Corruption and Public Finance", European Journal of Political Economy,Vol. 20, pp 1067-1077. Huntington,S.P; (1968), "Modernization and Corruption", in Political Order in Changing Societies, Samuel P.Huntington, New Haven, Connecticut: Yale University Press, pp 59-71. Hwang J; (2002), "A Note on the Relationship Between Corruption and Government Revenue", Journal of Economic Development,Vol.27,pp.161-177. Imam, P.A. & D.F .Jacobs; (2007), "Effect of Corruption on Tax Revenues in the Middle East", IMF WP/07/270, pp1-34. "Indicators", Asia-Pacific Human Development Report, 181-188. Jia Shao, Plamen Ch. Ivanov, Boris Podobnik and H. Eugene Stanley; (2007), "Uantitative relations Between Corruption and Economic Factors", The European Physical Journal B 56, 157-166. Kaufmann.D, Kraay.A and Zoido-Lobaton.P; (1999), "Aggregating Governance Indicators", Policy Research Working Paper,No.2195, Work Bank, Policy Research Department, Washington D.C.www.world bank.org/wbi/governance. Kolstad Ivar and Arne Wiig; (2008), "World Development", Vol.37, No.3,521-532. Lee,Y. Roger H.Gordon; (2005), "Tax Structure and Economic Growth", Journal of Public Economics: www.elsevier.com/locate/econbase,pp.1027-1043. Lindbeck, Assar; (1998), "Swedish Lessons for Post-Socialist Countries (mimeo)". Mahdavi.S; (2008), "The Level and Composition of Tax Revenue in Developing Countries: Evidence from Unbalanced Panel Data", International Review of Economics & Finance:www.elsevier.com/locate/Iref Department of Economics,pp.607-617. Mauro Paolo; (1998), "The Effects of Corruption on Growth, Investment, and Government Expenditure:A Cross-Country Analysis", Institute for International Economics,www.iie.com, 83-107. Meyer-Spasche, Jonna, Ludovica Gambaro and Ashikur Rahman; (2007), "Does Aid Decrease Tax Revenue in Developing Countries? ", The London School of Economics and Political Science, 1-44. Nye,J.S; (1967), "Corruption and Political Development", American Political Science Review, Vol 61, No2, pp 417-427. Parthasarathi, Shome, S.Mukhopadhyay and H.N.Saleem; (1997),"Administration in Value Added Tax in India" A Progress Report, ed. Parthasarathi Shome.New Delhi: Centax Publications. Roaf. J; (2000), "Corruption in Russia", Conference of Post-Election Strategy, Moscow, April. Schneider.F; (2006), "Shadow Economics and Corruption All over The World": What Do We Really Khow? Department of Economics Journal Kipper University of Link, Working Paper No.0617, pp1-73. Tanzi,V.& H.R.Davoodi; (2000), "Corruption, Growth and Public Finances" IMF Working Paper 00/182. Tanzi, v & Davoodi, H; (1997), "Corruption, Public Investment ,and Growth", IMF Working paper, WP/97/139, pp1-23. Transparency International; (2002-2006), Corruption Perception Index (CPI) at:www.transparency.de. Treisman Daniel; (2000), "The Causes of Corruption: A Cross-National Study", Journal of Public Economics, 399-457. Vasin Alexander and Elena Panova; (1999), "Tax Collection and Corruption in Fiscal Bodies", Working Paper No 99/10, 1-24. Wei,Shang-Jin; (1997), "How Taxing is Corruption on International Investors? ", The William Davidson Institute at the University of Michigan Business School, Working Paper.No.63. World Bank, World Development Indicators (2008). World Bank Corruption Report (2008).